Metallised films (or metalized films) are polymer films coated with a thin layer of metal, usually aluminium. They offer the glossy metallic appearance of an aluminium foil at a reduced weight and cost. Metallised films are widely used for decorative purposes and food packaging, and also for specialty applications including insulation and electronics. Its burning caused the crash of Swissair Flight 111 in 1998 that killed 229 people. Metallisation is performed using a physical vapour deposition process. Aluminium is the most common metal used for deposition, but other metals such as nickel or chromium are also used. The metal is heated and evaporated under vacuum. This condenses on the cold polymer film, which is unwound near the metal vapour source. This coating is much thinner than a metal foil could be made, in the range of 0.5 micrometres. This coating will not fade or discolour over time. While oriented polypropylene and polyethylene terephthalate (PET) are the most common films used for metallisation, nylon, polyethylene and cast polypropylene are also used. Metallised films have a reflective silvery surface similar to aluminium foil and are highly flammable. The coating also reduces the permeability of the film to light, water and oxygen. The properties of the film remain, such as higher toughness, the ability to be heat sealed, and a lower density at a lower cost than an aluminium foil. This gives metallised films some advantages over aluminium foil and aluminium foil laminates. It was thought that metallised films would become a replacement for aluminium foil laminates, but current films still cannot match the barrier properties of foil. Some very high barrier metallised films are available using EVOH, but are not yet cost effective against foil laminates. Metallised films were first used for decorative purposes as Christmas tinsel, and continue to be used for items such as wrappers and ribbons. 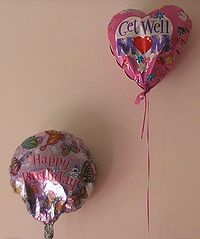 The metallic helium filled novelty balloons given as gifts are made of metallised BoPET and often called Mylar balloons commercially. Both metallised PET and PP have replaced foil laminates for products such as snack foods, coffee and candy, which do not require the superior barrier of aluminium foil. Metallised nylon and polyethylene are used in the meat export market. The controlled permeation extends shelf life. Metallised films are used as a susceptor for cooking in microwave ovens. An example is a microwave popcorn bag. Many food items are also packaged using metallised films for appearance only, as these produce a package with greater sparkle when compared to competing products that use printed paper or polymer films. Metallised PET films are used in NASA spacesuits to reflect heat radiation, keeping astronauts warm, and in ″proximity suits″ used by firefighters for protection from the high amount of heat released from fuel fires. Aluminized emergency blankets are also used to conserve a shock victim's body heat. MPET has been used as an antistatic container for other heat and sound insulating materials used in aircraft, to prevent the insulation from leaking into the passenger cabin, but is not itself the insulator in that use. Metallised films are used as a dielectric in the manufacture of a type of capacitor used in electronic circuits, and as a material in some types of antistatic bags. ^ Sun, Da-Wen (2016-04-19). Handbook of Frozen Food Processing and Packaging, Second Edition. CRC Press. ISBN 9781439836057. ^ Pardos, Françoise (2004). Plastic Films: Situation and Outlook : a Rapra Market Report. iSmithers Rapra Publishing. ISBN 9781859574805. This page was last edited on 27 March 2019, at 14:50 (UTC).